It reads: “You’re my favorite”. By The Pink Owl Designs. Want to add a little dazzle and sparkle to your reception? You’ll love these rhinestones from Totally Dazzled for your invitations, programs, menus, and more. Because, why not? I want one in my house just because! By Sparkle Soiree. For your centerpieces, cake table, or anywhere else you see fit! By The Paisley Moon. By Shades Of Pink Paper Btq. For placement at the bride’s chair and the groom’s chair at the reception. By Magpie Linens. From ByIve. In gold, silver, or rose gold. From reception to home decor in an instant! By LettersFromAtoZ. Ah, I adore these: beauty and function all in one! By Kara’s Vineyard Wedding. RELATED: Giveaway: Win a Pair of Crystal Drop Earrings! You can see it here. By Important Day. P.S. Which of these twenty-one finds is your favorite? I love the heart rhinestone flat back. Beautiful and simple. Perfect for a little sparkle on my special day! Omg all this giveaways are awsome i hope you pick me as the winner . I have never one anything. I love all the awsome things you have to offer. 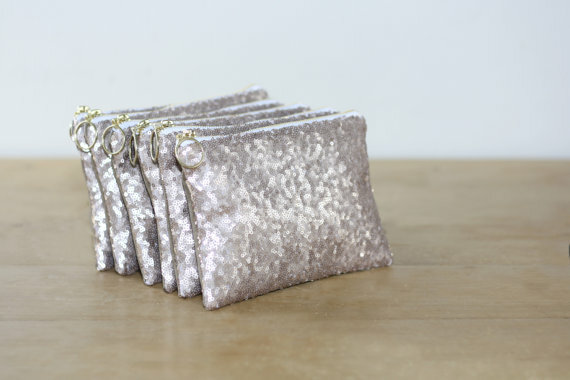 I really REALLY like the sparkly clutches (would make great MOB MOG and Bridesmaid gifts!) as well as the sparkly ceremony backdrop! SO PRETTY! The pearl embellishments would look great on my ribbon rose toss bouquet! My absolute favorite is the Antique Starburst Rhinstone Brooch 407-S. Gorgeous!!!! I love the hair comb by Gadegaard Design! The bridal sash is so perfect. It’s simple but still so cute and adds some seriously classy sparkle. Love the rhinestone napkin rings! 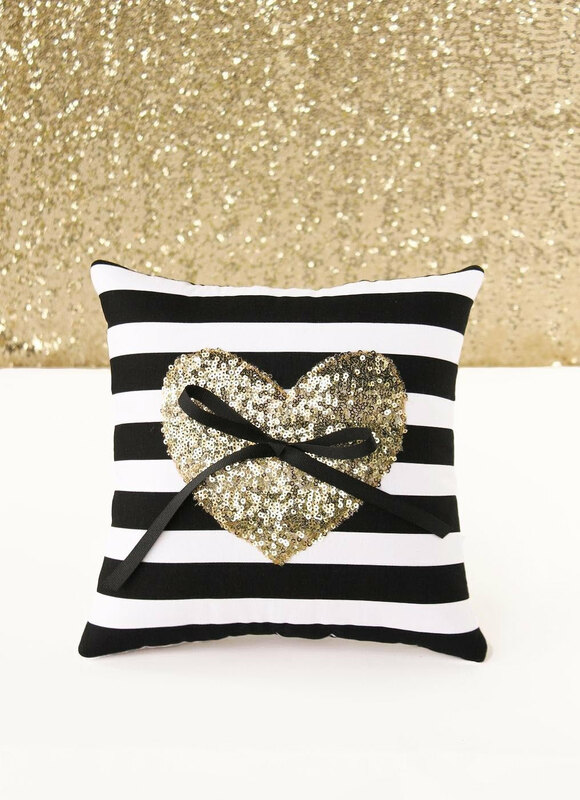 The black and white ring pillow is my favorite! I love the centerpieces and dress belt! I love the GOLD FLORAL RHINESTONE FLAT BACK 544-G!!!! Simple yet classic. I love the RHINESTONE NAPKIN RING 544-S-N! They would look great against our napkin colors! I love the crystal starfish design! I love the napkin rungs! Such an elegant touch without being too overwhelming! I love the brooch bouquets! I love the mason jars. I would get these for my rustic wedding! I love the heart rhinestone flat back! So pretty! I love the napkin rings! I love the mason jars! I love the wedding napkins especially with the blue napkin. Adds an elegant but simple touch! 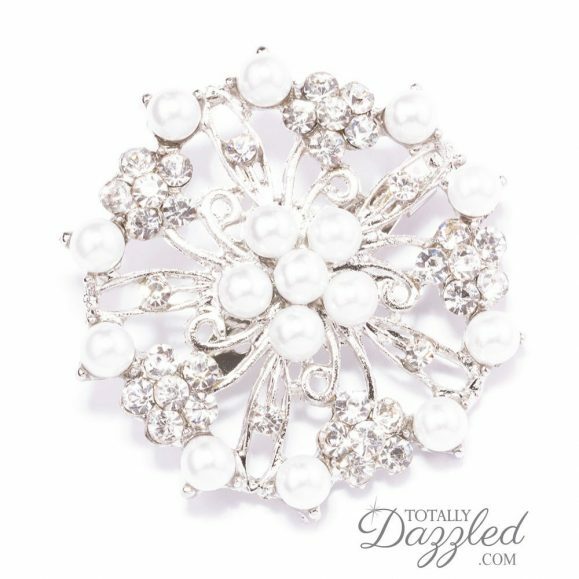 I love the pearl flower rhinestone broach! FLOWER RHINESTONE AND PEARL BROOCH is super cute! All of the pearl brooches are great! Wthese are simply perfect to add sparcle to almost everything. I love the Flower Rhinestone and Pearl Brooch 411-S! This would match my dress and give everyone a taste of what the wedding may look like once they see this on the invitations! These are a must for my wedding! I like the PEARL AND RHINESTONE FLOWER BUTTONS 706-S! OH MY GOSH! What is not to love! I love the mason jars, table numbers, and dipped vases! They are absolutely beautiful! Our wedding is going to be the blue spectrum and glitter! THESE ARE PERFECT! Beautiful work! I am a sucker for pearls. They match anything right?! I LOVE the flower rhinestone and pearl flat back. This style matches any wedding, vintage or classic and again…who doesn’t love pearls?! Loving the Paisley Moon Centerpieces! 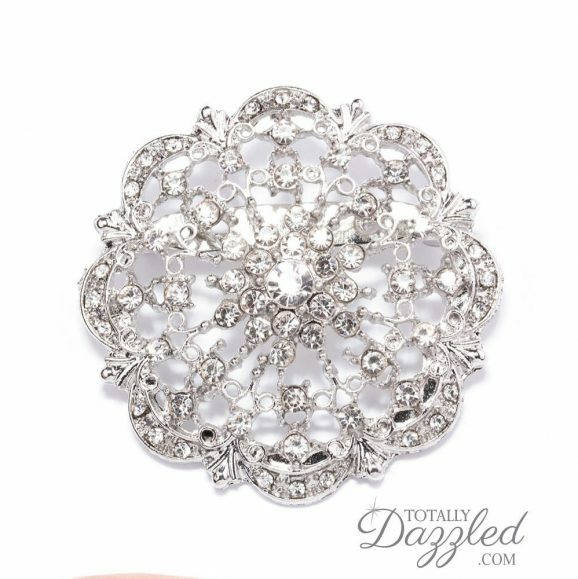 I really love the VINTAGE CRYSTAL BROOCH 409-S! It’s so beautiful. The sequin throw pillows are to die for and they would be perfect in the bridal suite for pictures as the girls are getting ready. I visited the Totally Dazzled website and fell in love with the GOLD DIAMANTE DOUBLE HEART BUCKLE . It fits absolutely perfect with the theme of my wedding and it literally screams my name. I love rhinestones, gold, and hearts. I can’t stop thinking about the DIAMANTE LEAF FEATHER BROOCH 413-S – it’s so pretty, I might just have to buy it! I love the Silver Starfish Rhinestone Slide Buckle!! So awesome! GOLD DIAMANTE SNOWFLAKE FLAT BACK 541 G is absolutely beautiful! I love the pearl and rhinestone napkin rings! I love the diamante flower brooch! My favorite is the VINTAGE DIAMANTE NAPKIN RING! I love the hair broach. I am looking for something similar for my wedding. Also, the glittery tea lights and invitations are very glam. Love the rhinestone mesh ribbon! The brooch bouquet is gorgeous!! I want this look for my Gatsby wedding! I absolutely love the rhinestone napkin rings! Love the hair comb & Mr. & Mrs. signs. The pearl embellishments are beautiful, a simple touch to our wedding day! Great choices, Chelsea! Good luck! Thanks for entering the contest! Good luck!